Carrot Recipes - Recipe collection for this mouthwatering root vegetable. Cocktail Recipes - Colorful and interesting drinks. Orange Recipes - Citrus fruit used in food and drink. Valentine Recipes - Show that special someone you really love them. Vegetarian Recipes - Recipe collection free of meat and fish. Fondues may include savory foods like ham and garlic, but they may also include sweet foods like chocolate and fruits. Use them as an appetizer, dessert, or even as the star of the meal. Experiment with flavors you usually enjoy in a stew or casserole, but incorporate them into the Fondue style. Bring long forks and skewers for the tasty ride, and enjoy dipping your favorite foods in your new favorite dip. Cheese fondue was invented out of necessity. In the remote and isolated mountain villages in the Swiss Alps people had to rely upon locally made food. 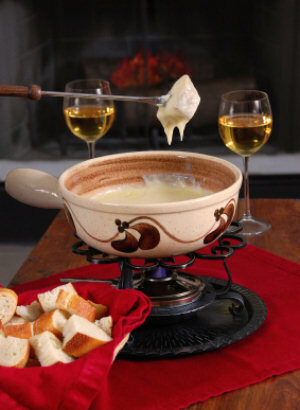 Over 100 varieties of cheese fondue exist, each with a unique name and different blend of cheeses, wine and seasoning.